Following the success of our sold out The Real Story: In the Half-light event at last year’s Not Quite Light Weekend, we’re teaming up with Not Quite Light again to present The Real Story: Transition on Friday March 29th. 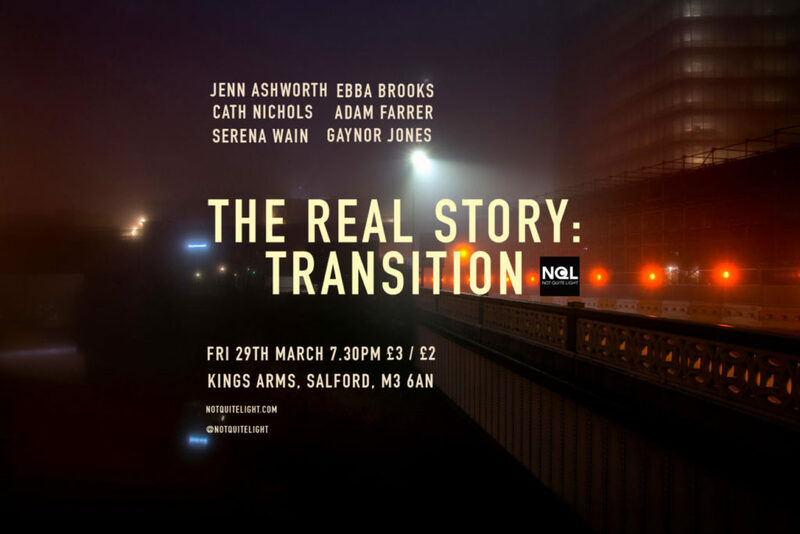 Novelist and essayist Jenn Ashworth will headline an evening of nonfiction stories exploring the themes of twilight, time and transition, supported by a bill of established and emerging writers, who will perform specially written pieces for this event, held at The King’s Arms in Salford. Jenn Ashworth’s first novel, A Kind of Intimacy, was published in 2009 and won a Betty Trask Award and upon the release of her second novel, Cold Light, was featured on the BBC’s The Culture Show as one of the UK’s twelve best new writers. Her fourth novel, Fell, was released in 2016 and her first collection of essays, Notes Made While Falling is due for publication in October. She lives in Lancashire and teaches Creative Writing at Lancaster University. Cath Nichols was born in Kent, 1970, but spent her childhood in Papua New Guinea and New Zealand. She is the author of two pamphlets, Tales of Boy Nancy (Driftwood, 2005) and Distance (Erbacce Press, 2012) and a collection, My Glamorous Assistant (Headland, 2007). She holds a PhD in Creative Writing. Her latest collection, This is Not a Stunt, was published by Valley Press in September 2017. Gaynor Jones is a freelance writer and spoken word performer based in the North West. In 2018 she won the Mairtín Crawford Short Story Award and was named ‘Northern Writer of The Year’ by Northern Soul. I was also nominated for the Pushcart Prize, Best Small Fictions and Best of The Net. Her first flash fiction collection, ‘Business As Usual’ was released in January 2019. Ebba Brooks teaches creative writing at the University of Leeds and digital skills at the University of Salford. She is a former journalist and book festival founder. Serina Wain is a spoken word artist, writer and singer. A seasoned performer, her honest and moving nonfiction-based poetry and short stories have made her popular with live literature audiences across the region. She lives in Manchester, where she works as a primary school teacher and life coach. Adam Farrer creative nonfiction writer and spoken word performer based in Manchester. His work can be found at BBC Online, This Is Not TV, TheMagPi, The Drabble, Squawk Back and in the anthology of comic essays ‘Flash Nonfiction Funny’. He is the Writer in Residence for Peel Park, Salford and the Editor of The Real Story. Tickets available right now, at a special low price, thanks to the support of Arts Council England. Posted in Events, News and tagged Cath Nichols, CNF, creative non-fiction, ebba brooks, essayists, Gaynor Jones, Jenn Ashworth, Liv lit, live readings, not quite light, Not Quite Light Festival, Not Quite Light Weekend, Original Nonfiction, spoken word, the real story, The Real Story Live. Bookmark the permalink.